BUSHMAN, is an artist carved out of the same musical tradition as Bob Marley, Dennis Brown and Luciano, who he quotes as being his dominant influences. 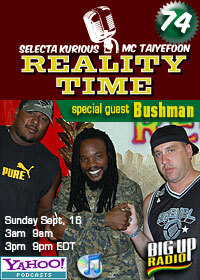 Hailing from the small rural parish of Prospect Beach, BUSHMAN was raised as a Rastafarian. By the tender age of nine he had grasped his musical potential, and his passions for football and cricket were fast overtaken by a commitment to the local church choir. Moving into his teens and now known as Junior Melody, he kicked off his career proper as a selector (selecting the records played on a sound system) on the Black Star Line sound system. Taking his talent to the next stage meant travelling seventy miles to Kingston, as there were no studios in St. Thomas. Being poor he would have to hitch-hike before waiting around all day for the opportunity to record. Months passed in this way until he happened to meet top Jamaican producers Steely and Clevie at Arrows Dubplate Studio during an impromptu game of football. Steely immediately invited him to audition for his studio, Studio 2000. Find out more here.